extends over the bed rails --our custom "Formed" Chevy Silverado/GMC Sierra base plates and #2 uprights fit perfect! 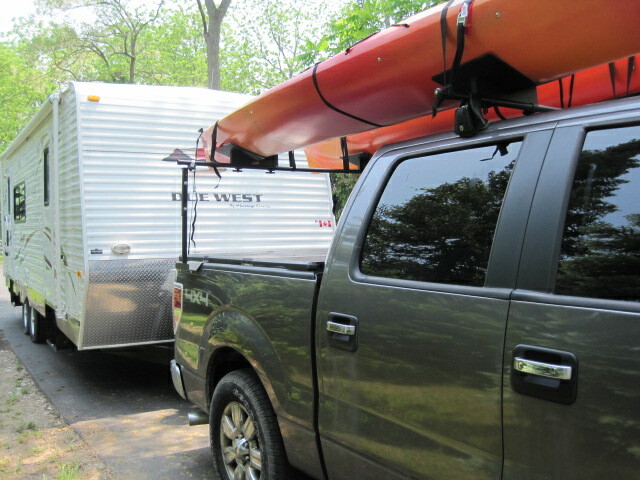 Very solid for up to two canoes or multiple kayaks. 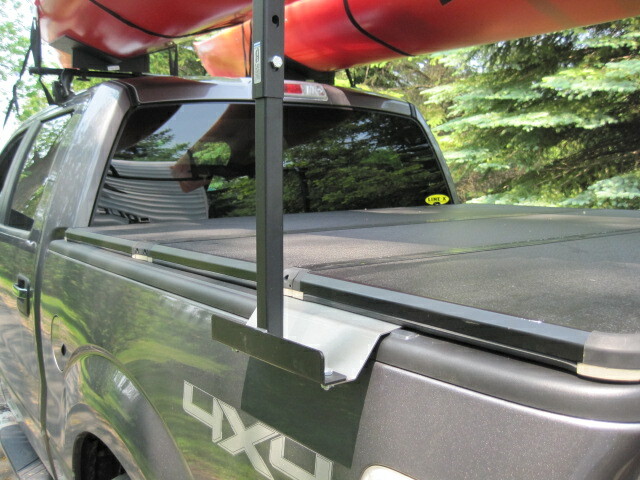 Our Style #2 Truck Rack is compatible with most hard or soft tonneau covers & caps we see. 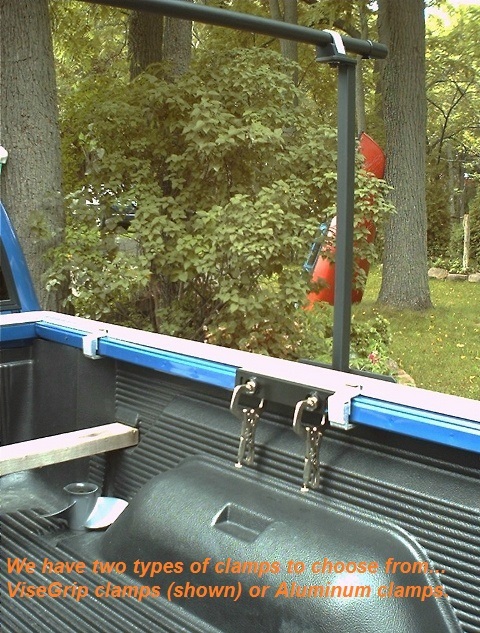 #2 uprights are 1 inch square HD steel with a black finish; complimenting the appearance of your truck. Will not shake, rattle - like competitors folding in the box style. 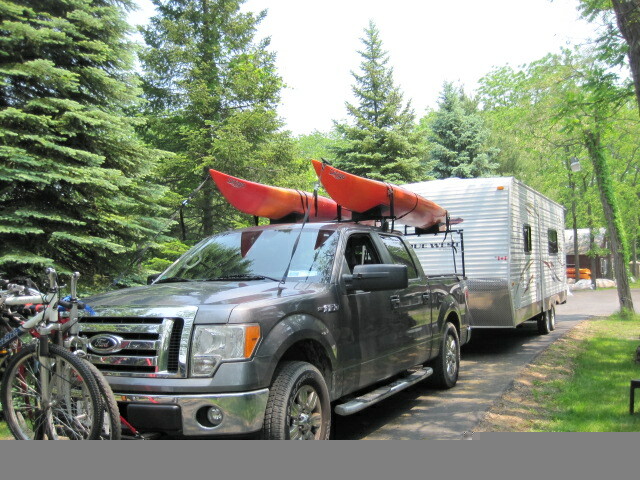 Carry up to 2 canoes OR up to four kayaks. This way your craft is secured to the rack, as well as secured to the vehicle. When done properly your craft is immobilized against any type of movement; front to rear or side to side. Here's a Dodge truck with a cap that's really high in the back. We used our standard flat base plates and extra tall uprights. 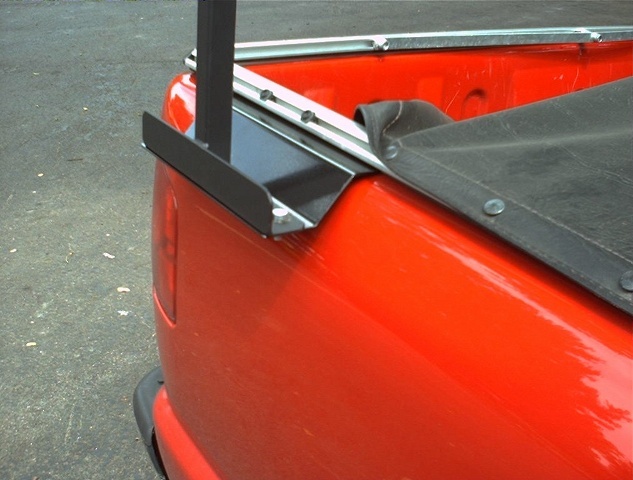 For older trucks and utility trailers our Uprights can be bolted directly onto the bed rails. OR add our "Flat" base plates. 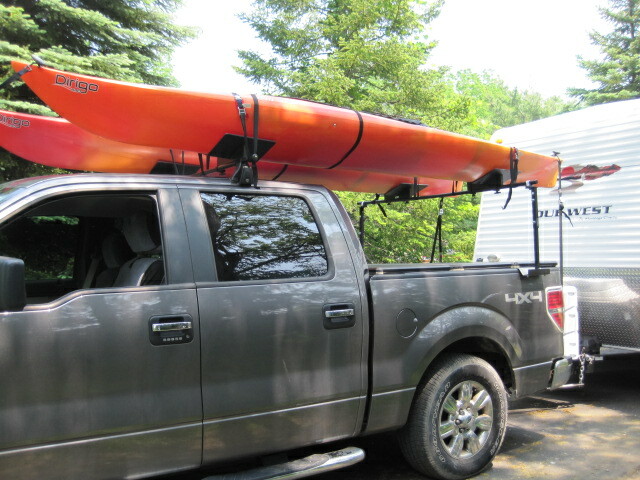 For most modern Trucks; especially if you have a cap or tonneau cover, use the appropriate width "Formed Base" plates. These plates can mount over the bed liner or chip guard if there is one. Please assist us with getting the correct width base plate by "measuring" the width of your truck bed's side rails (flat portion) top area. We have 9 different shapes/width Custom Base Plates plus our standard Flat Base Plates! 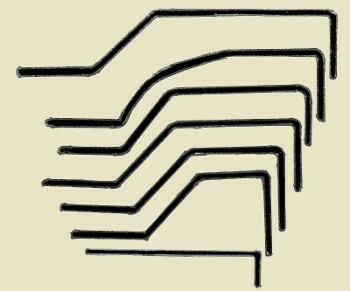 below: six of our different Formed base plates and our standard Flat base plate. Note: Different trucks require different uprights and plates. your truck's bedrail and your cap or cover. We offer standard size uprights OR adjustable uprights AND several Base plate options to best suit your truck. the Style #2 Rack that fits your vehicle. Also shown (bottom), our generic "Flat", base plate that will fit under most FG or Aluminum camper tops.